With such intriguing headlines as “Add Ice to Your Bucket”, “Remote Wonders Revealed”, “Edges of the Earth”, “Polar Precision”, or “Taking Comfort to Remote Places It’s Never Been Before”, my dear friend and neighbor, Dorothy Trevino, and I really had no idea what to expect when we decided over a year before to book an expedition cruise to this truly remote part of the world. Sailing aboard Silversea Cruises’ 132-guest Silver Explorer Expedition Cruise ship, we departed Tromso, Norway, June 23rd on a cold, rainy and foggy afternoon. (Just to give you an idea where Tromso is – it’s over 700 miles north of Oslo, Norway and resembles the Alaskan towns of Ketchikan or Juneau.) 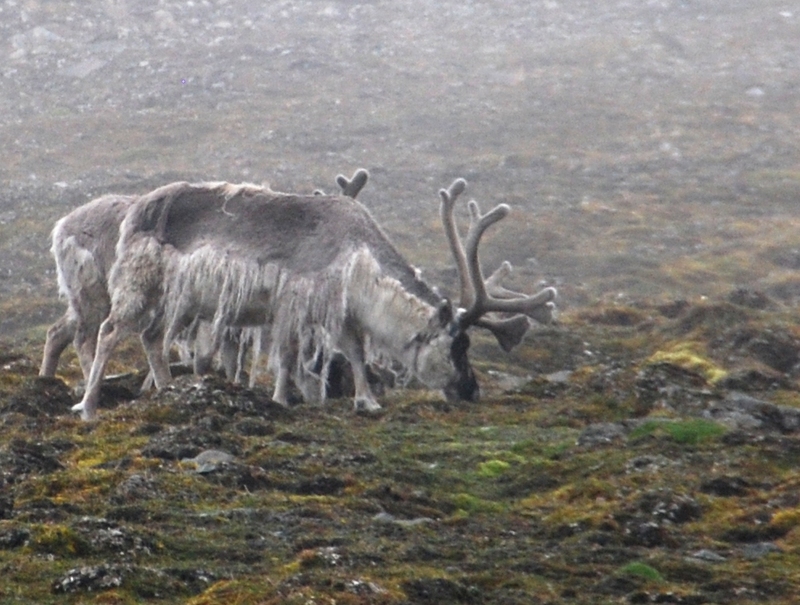 Ten amazing and incredible days later…we debarked in Longyearbyen, Norway – a small, remote community that is just a few hundred miles from the North Pole! Dorothy Trevino (left)and I at “the top of the world”! The ship sailed with 115 crew – so on our itinerary, the ratio was more than 1:1. Our stateroom was small – but very comfortable and with exceptional amenities. There were two areas of the ship that attracted the most attention and the best attendance: The dining room (for breakfast, lunch and dinner – unless you opted for room service) and the theatre where all the lectures and briefings were held each afternoon/evening. There is no casino, no shows, no movie theatre – no entertainment except for one gentleman who played background music in the dining room and bar area each afternoon and evening. From our first daily briefing of what was to be our itinerary/plan for the next day, we learned very quickly that the keyword was “Flexibility” as weather conditions could change on a dime and polar bear sightings on land meant we couldn’t be on the same turf at the same time with the bear. In other words, our expedition team was not only responsible for protecting us from the polar bears, but for protecting the polar bears from us. This 15-member Expedition Team was an amazing group of gentlemen and ladies who were incredibly smart, funny, interesting, and very professional – such as our expedition leader, Juan, a geologist from Colombia; Robin, a Harvard-educated marine biologist from Boston who was the marine biology lecturer and also zodiac driver; and our birding expert, Simon – a middle-aged, self-taught Brit who gave up a career in banking to start a new career from his hobby of ornithology. We learned so much from this group of wildlife experts. And there’s no doubt: This team loves what they do! Now… let this amazing expedition adventure begin! Dorothy and I quickly discovered that we probably burned at least 500 calories each morning just getting into our gear that included two sets of long underwear, ski/rain-proof pants, heavy pair of sox, down jacket, rain-proof parka, wool hat, extra head gear for ears, glove liners, gloves, neck gaiter, life jacket and backpack with camera equipment, plus our very heavy water-proof boots. We needed every bit of our cold-weather gear – as the temps throughout the expedition averaged between 31- 37 degrees F. and daylight 24-hours a day. 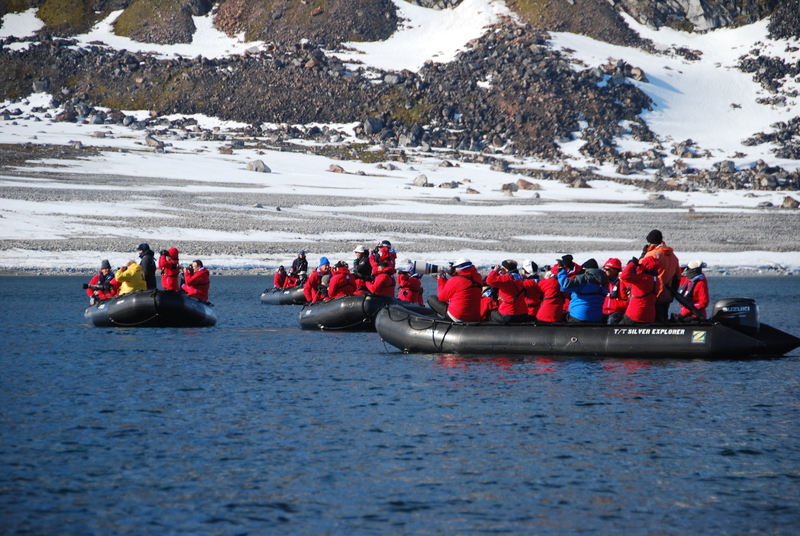 Our first excursion via zodiac (a zodiac is a sturdy, inflatable rubber boat powered by an out-board motor) was a two-hour tour of Bear Island. Truly an oxymoron, as the island – not known as a permanent residence for polar bear – acquired its name because the two men who founded the land mass in 1596 saw a polar bear swimming nearby – hence the name. Rock formations here date back to 400 million years! 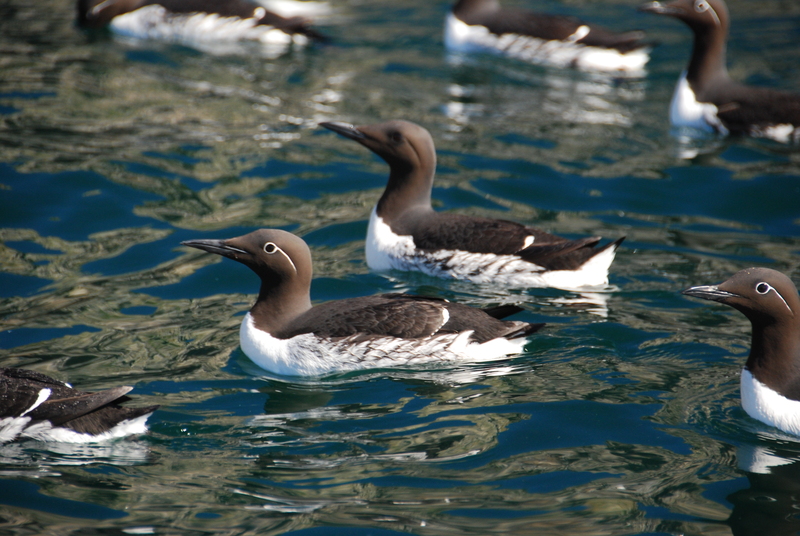 The island is rich with birds: Guillemot, Puffin, Fulmar, Black-legged-Kittiwake, Glaucous Gull and other beautiful seabirds. 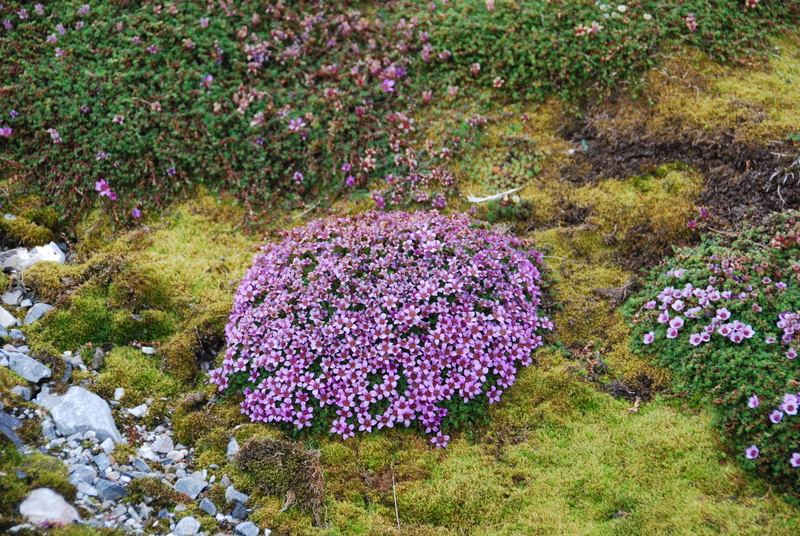 Our next day’s excursion was a wet-landing and a delightful hike on tundra – with stunningly-beautiful flowers. 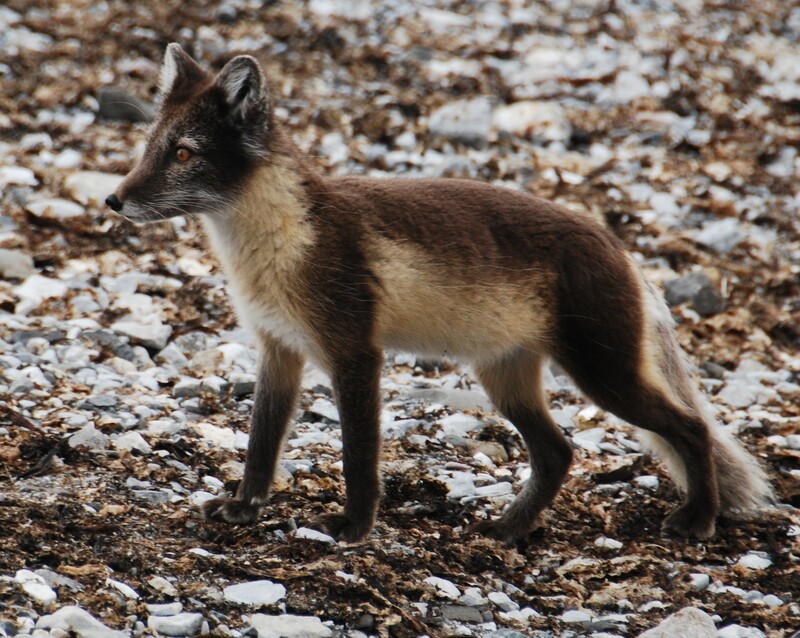 What started as a cold, foggy day with low-hanging clouds quickly “brightened” when we encountered an arctic fox – a small, inquisitive creature (average weight only 5 1/2 – 11 pounds) that adapts to the changing seasons. In winter, the fox is snow white to blend with the snow; in summer, his fur changes to a brown/gray and he blends into the mountainside and tundra. The arctic fox has furry soles, short ears and a short muzzle – all very important adaptations to survive the brutal winters. His most valuable asset in winter: his bushy tail that he wraps completely over his head/ears to stay warm. Next day, another hike – and I mean hike! By the time we got to the top of the mountain, we were soaked in perspiration – even though the temperature was only mid-30s F. The tundra was dotted in beautiful flora – such as purple or white saxifrage, yellow buttercup, and polar willow. For Wednesday, June 28th, we had to stay on board because of the fog. 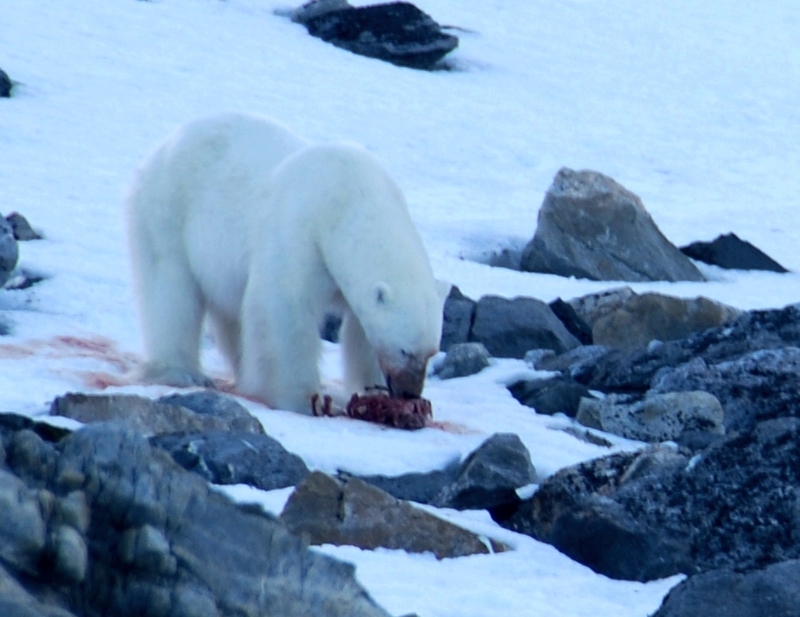 The itinerary was changed twice and you could tell the Expedition Team was getting very anxious that we might NOT see polar bear – one of the main reasons people choose this itinerary. Finally in late afternoon, the fog started to lift – just enough – that we were able to board our zodiacs and look for walrus. 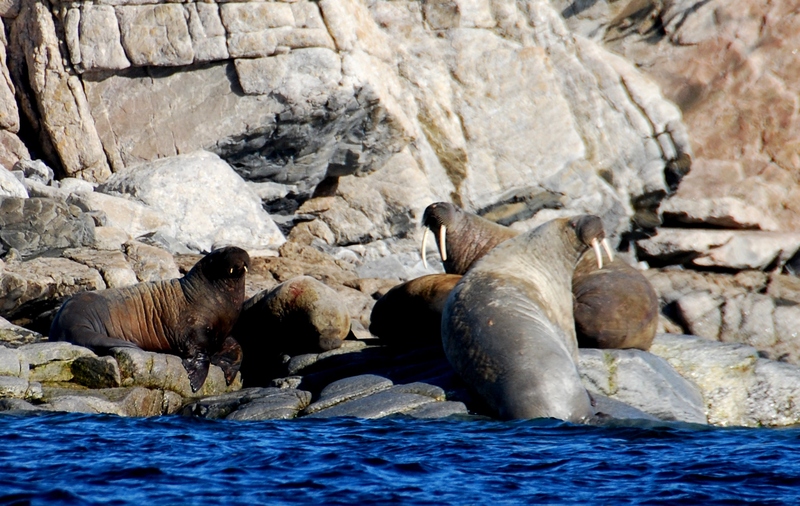 We “saw”walrus – from a great distance – but not close enough for good photos. After 2 1/2 hours of searching for wildlife, we returned to the ship – cold, wet and ready for a hot shower and a cold cocktail before our evening entertainment of the daily briefing and a delightful 2-hour, multi-course dinner. Thursday, June 29th began with a ship-wide P.A. announcement at 6.30 AM that “polar bear had been spotted” and that we would start loading into the zodiacs in 30 minutes! Dorothy and I were very fortunate to be in the same zodiac with Juan, our expedition leader. What an outing this was! The sun was out. The scenery was spectacular. Sun glistening on the glaciers and snow-capped mountains that merged with the calm blue ocean water. Absolutely the most beautiful sight- ever. Let the photo shoot begin! Our group was taking photos of the two bears with everything from a cell phone to professional photographers utilizing tripods and lens three-feet long. It was just such an amazing and an incredible, incredible sight! As we started heading back “home” to our ship, Juan said “I feel like 500 pounds have just been lifted off my shoulders.” Twenty miles and three hours later, we returned to the ship at 10am – cold, hungry and so, so thrilled with the incredible sights we had just seen. (And it’s interesting to note – that just like an African safari where all the drivers communicate with one another about sightings of the Big 5 – all the zodiac captains were doing the same thing – giving coordinates and land marks as to where the bears were located.) Indeed, it was all downhill from here… We saw THE bear! Next, as we “coasted” on the morning’s adventure, our ship headed toward the Polar Ice Cap. 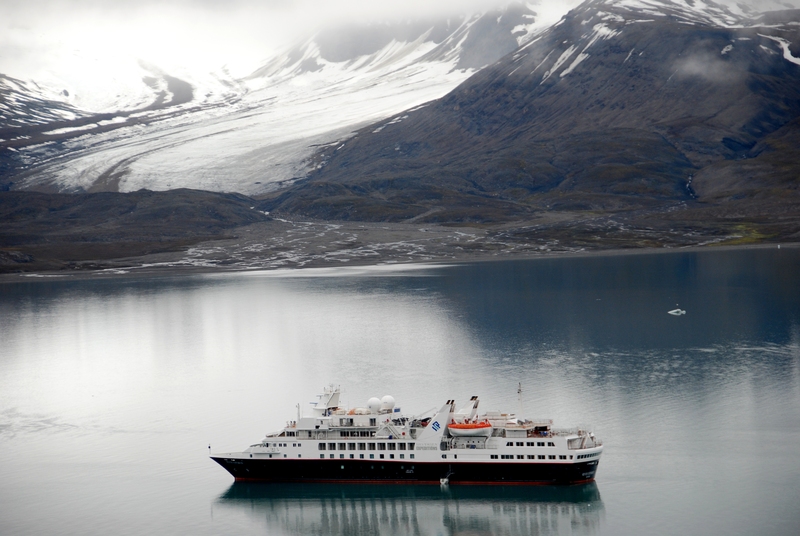 Soon, we were experiencing – firsthand – what it was like to sail aboard an “ice breaker” vessel. 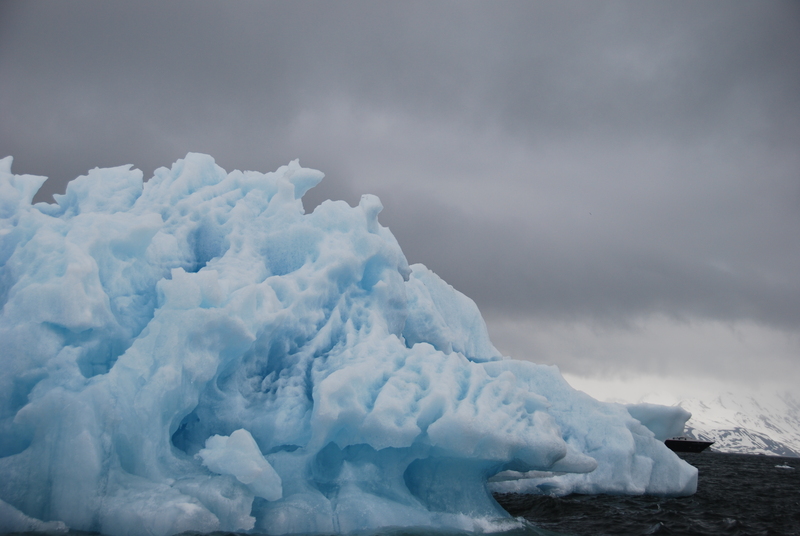 The ice formations and colors – like a kaleidoscope – hard to describe, it was so spectacular. 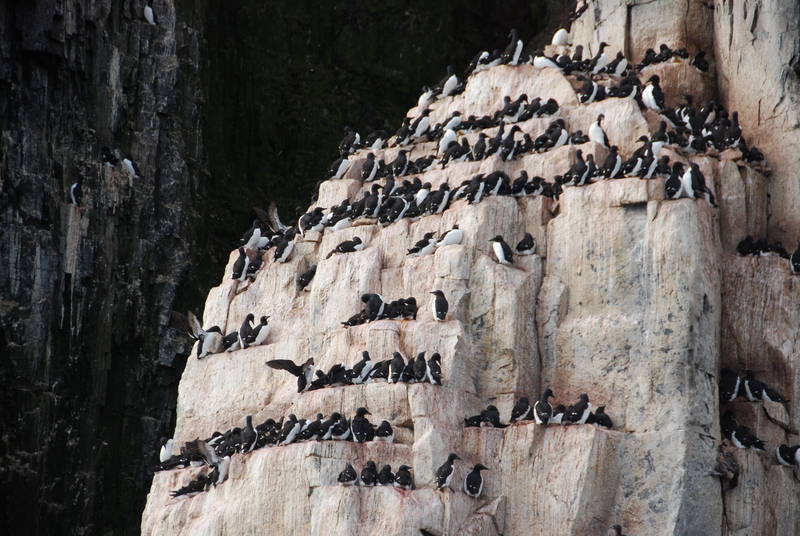 Two more excursions to go: this afternoon, a “must see” bird cliff of “a million birds” (well, maybe slight exaggeration) and, then on our last day… a hike on the 14th of July Glacier. 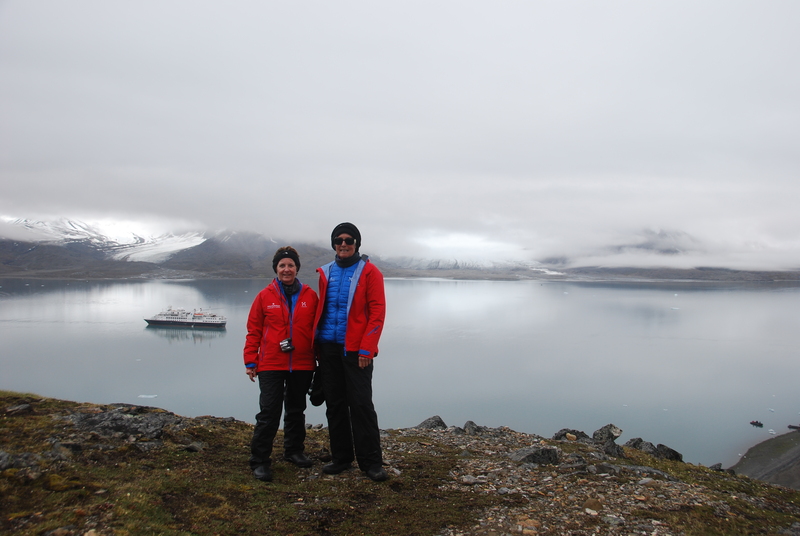 On Saturday, our last full day, we anchored early that morning in Ny Alesund. A very small outpost community, the town is comprised of mostly foreign scientists. 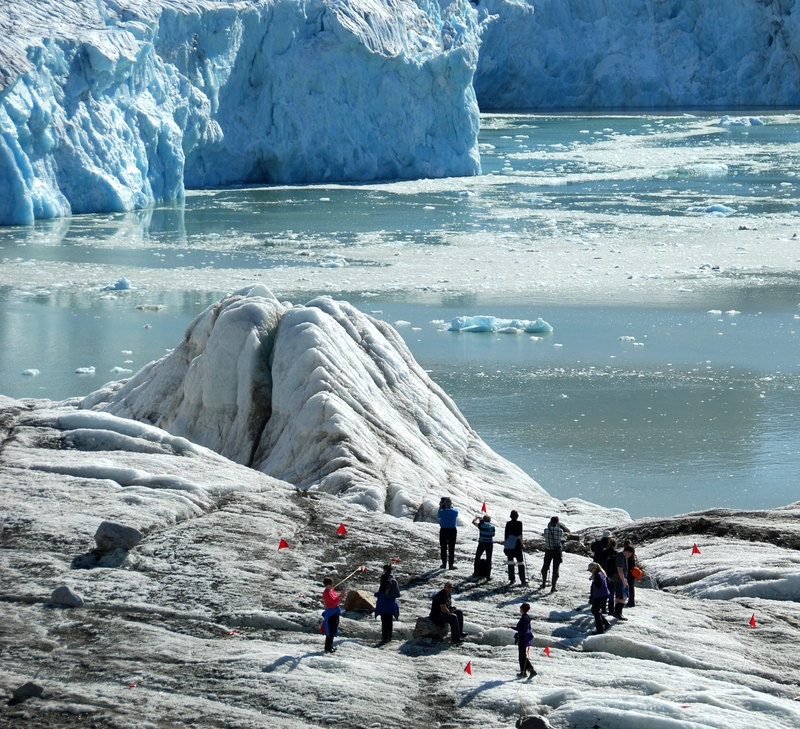 Located at the 79th parallel, it is recognized as “the northernmost town in the world!” After buying souvenirs – from the only store/port on the entire itinerary – we headed for the 14th of July Glacier (Bastile Day Glacier) for a 3 km hike. Accented with very narrow, rocky passages and steep climbs up to the top of the glacier followed then by a steep descent to the ice, it was challenging. Plus, the temperature that day got up to almost 50 degrees F. so you were hot wearing all your gear. Again, the vistas were indescribably beautiful as clear, pristine air enhanced our view of glacier ice touching calm blue waters and all surrounded by mountains that jutted straight up – seemingly for miles – until disappearing into the clouds. Dinner this evening was bittersweet. It would be great to get back home, but we were leaving behind one of THE most beautiful – truly beautiful – parts of the world. Everyone we visited with the last night all seemed to express the same feeling – a feeling of gratitude and appreciation for having had this incredible chance to see and experience and enjoy such a pristine and pure part of this world – a part of our world that not many people would ever have the fortunate chance to see and explore. Dorothy and I were truly grateful for this opportunity. 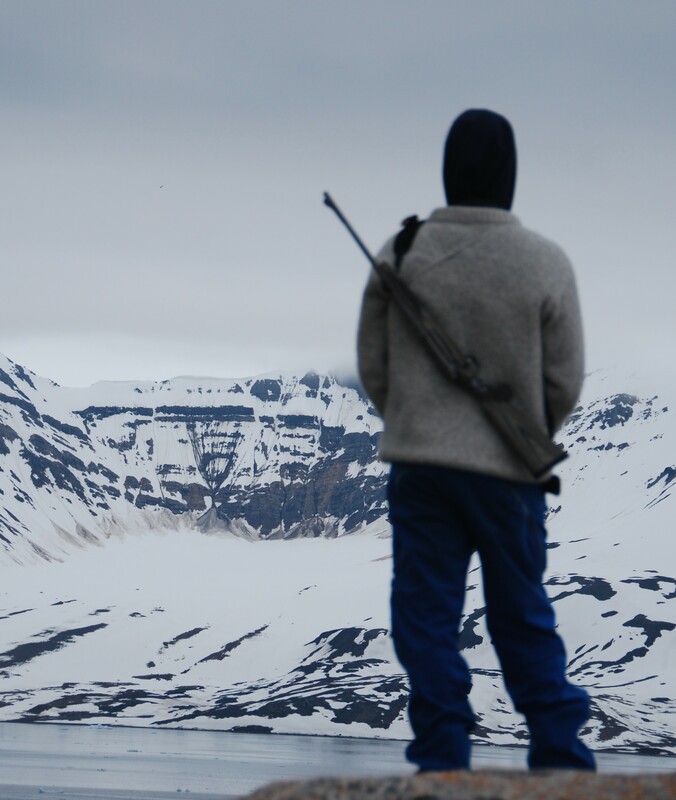 The next morning, we debarked – via zodiac – in Longyearbyen for our charter flight back to Oslo. We overnighted in Oslo at the airport Radisson Hotel on Sunday, July 3rd. We departed the next morning around noon (Norway time) and arrived back in the USA and Houston/Galveston that evening -on the 4th of July! Indeed, each of these intriguing and enticing headlines: “Add Ice to Your Bucket”, “Remote Wonders Revealed”, “Edges of the Earth”, “Polar Precision”, or “Taking Comfort to Remote Places It’s Never Been Before” truly and authentically described our Arctic Adventure in this remote archipelago of Svalbard, Norway! To say that this expedition cruise aboard the Silver Explorer was a “trip of a lifetime”… is definitely an understatement. Highly recommended! Footnotes: For more information about Silversea Cruises and the Silver Explorer’s itineraries, contact your travel professional or visit www.silversea.com/destinations/arctic–cruise. Dorothy and I booked our cruise through Fox Travel/American Express, The Woodlands (Houston), Texas. Our cruise planner was Debbie Parker, a very knowledgeable and professional individual who provided us excellent service. It’s also very important that you have the proper gear. Everything we took, we wore. 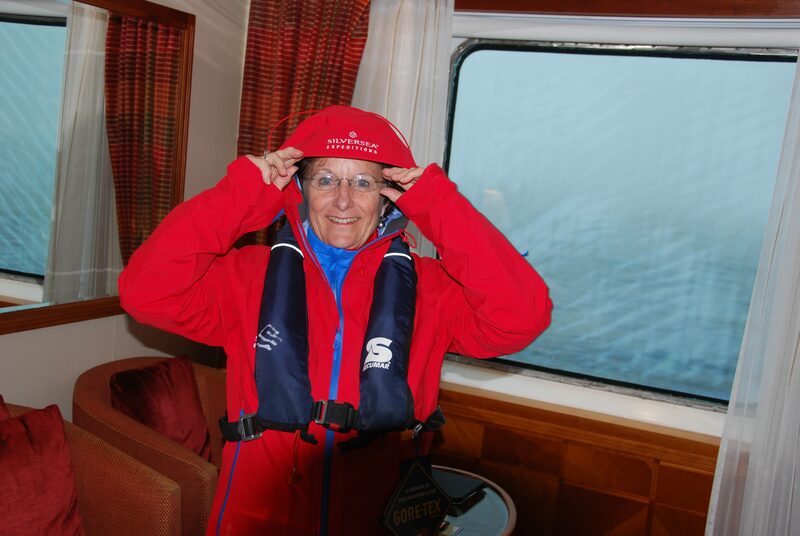 Silversea provides an excellent outline of what you need – including special waterproof boots (that are almost knee high and rugged.) You can not do this itinerary without the boots. One important thing I learned, however… should your luggage be lost – the boutique shop onboard Silver Explorer should have everything you’ll need for cold-weather gear so that you can participate in the daily expeditions. In addition, most likely, you would be able to “borrow” a pair of boots, as many departing guests choose to leave their heavy boots for future guests, as versus lugging them back home. The reason I’m sharing this with you, is that my one checked bag was delayed between Frankfurt and Oslo. And we weren’t sure IF it would arrive before we flew the next morning to Tromso. (And since there are NO ports of call on this itinerary until the last day, there’s no opportunity for your luggage to catch up to you.) Just know that you should have a chance to replace what you need in the ship’s boutique in the event you have to sail without your luggage.